The World Health Organization released their annual report on the world prevalence of tuberculosis in 2008. The report said that there were 9.8 million cases of tuberculosis, with 1.8 million resulting in death. The report also said that their were 440,000 cases of multi drug resistant tuberculosis, with about one-third of them being fatal. The average cost to treat a case of tuberculosis was US$20 (€14.78, £13.32), over a six month period. The cost to treat a case of drug resistant tuberculosis was US$500 (€365.55, £333.00), and up-to two years of treatment. Some of the hardest hit regions include nations of the former Soviet Union. Specifically Tajikistan which according to the report “[had] proportions of 16.5 percent MDR-TB [sic:Multi-Drug Resistant tuberculosis] among new TB cases and 61.6 percent MDR-TB among previously treated TB patients in Dushanbe city and Rudaki district, or the highest proportion ever reported among previously treated TB patients in a subnational area,”. 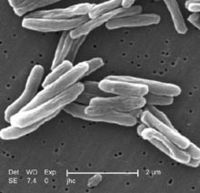 The prevalence of tuberculosis in the United States dropped 11.5% with only 11,540 new cases, with 108 of them being drug resistant.